June 6 marks the 50th anniversary of the tragic, violent, death of Robert F. Kennedy, at the hands of assassin Sirhan Sirhan, who shot Kennedy on June 5, 1968. Kennedy, a New York State Senator at the time of the shooting, was murdered while campaigning for the Democratic Party’s presidential nomination. Kennedy had just won the California primary that day. Belkin published a statement on behalf of Yeshiva University on the death of Robert F. Kennedy: “The Yeshiva University family shares the grief of the nation stunned by still another tragic act of violence again a man and therefore against God. The catastrophe also represents a personal loss to me and to the university. 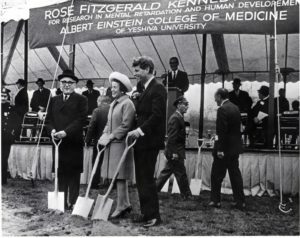 With his mother, Senator Kennedy made possible the development of the Rose Kennedy Center at Yeshiva for the study of mental retardation. We were blessed by his friendship and impressed by his warmth and generosity of spirit.” Dr. Belkin concluded: “We must do more than express sorrow and denounce violence. We must dedicate ourselves anew to restoring the moral purpose that motivates us as Americans and as Jews. We are our brothers’ keepers. We must act upon our beliefs by refusing, as John and Robert Kennedy refused, to accept the inevitability of pain for others. 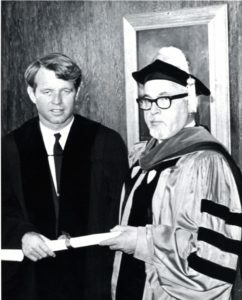 When we do, we shall make God’s work truly our own.” President Lyndon Johnson declared June 9 as the national day of mourning for Robert F. Kennedy; Dr. Belkin dedicated all University events that day to the memory of Senator Kennedy.